By looking at the Geo Distribution report, you can identify the countries and regions where a website gets most of its visitors. In addition to being able to analyze the total traffic and traffic share % from each country, you can compare each country’s visitors behavior in terms of pages/visit, average visit duration, and bounce rate to identify which regional markets interact the most with this website. With the historical data filter you can analyze different periods of time. The tool currently can analyze traffic in 190 countries and regions. Selecting a different country in the “Location” filter above the map will highlight that country’s traffic share to the analyzed domain. 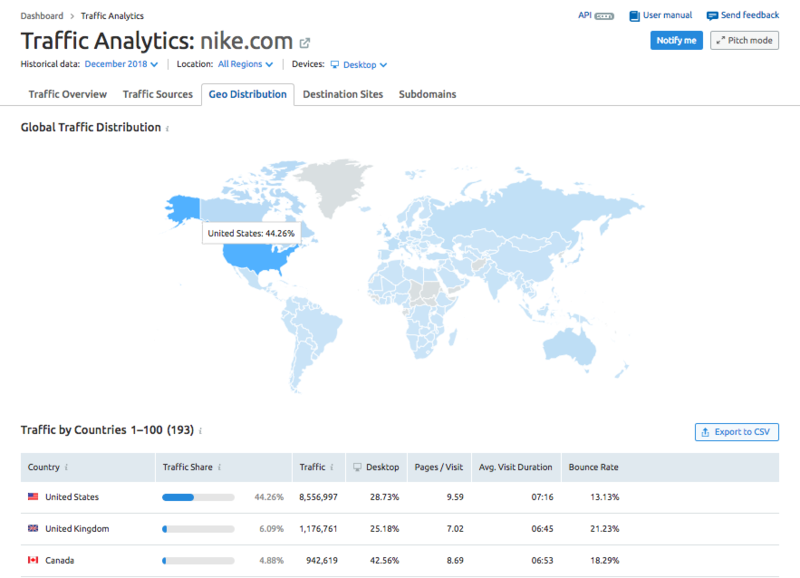 Not only can you select the different locations but you can analyze the mobile traffic data broken down by country (as well as desktop or total traffic). Use this information in a competitive analysis to understand what global markets your competitors or partners are leveraging. With this, you can discover a region that could represent a new opportunity for your own online business. You can save all of the metrics in the table by exporting to a CSV.